SK Gaming | Content: ESL RACE07: Grand Final in Curitiba LIVE tonight! After qualifying and knock-out stage, it's about time to find this year's ESL RACE07 Pre-Season champion. 24 pilots qualified themselves for the final stage with the chance of winning 250€ overall. Three of them are starting their engines for the SK Gaming Racing Team! Danny 'HuskY' Engels, Hendrik 'b0nd' von Eye and Christoph 'DreaF' H&ouml;renbaum do all have the chance of winning the event title tonight. The SK-trio already dominated the ESL RACE07 Pre-Season Qualifying few weeks ago. Hence they are absolute favorites and wearing starting numbers #1, #2 and #3 on their SK Gaming WTCC BMW E90 320si's. 14 laps races before the new champion is going to be crowned with success. 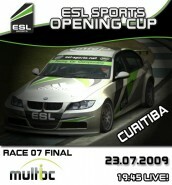 Check SK Gaming's ESL Motorsport Pre-Season Eventsite for the MultiBC Livestream!